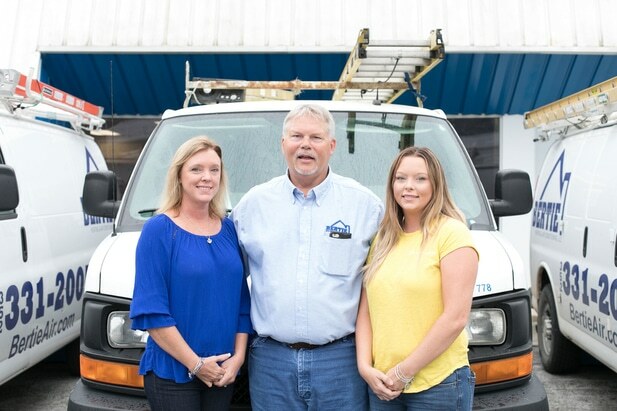 Family owned and operated business with over 25 years of experience that prides itself in building good customer relationships. Due to our close ties to the community, the entire staff at Bertie maintains a drug-free policy. We sustain a professional and reliable attitude within the office as well as in the community. Bertie Heating & Air Conditioning LLC, is a proud member of Ask the Seal. It provides our clients the peace of mind knowing that the representative of our company has a clean background check. It is also available to the customer upon request before the technician is dispatched to the residence. Bertie purchases applicable permits required to perform work in homes and business’ for our client’s protection. This gives the building inspector the ability to examine our work and reassure the customer or owner that the job was indeed performed properly. We are required to maintain a state license and liability insurance to protect our clients and customers from being taken advantage of by unlicensed and uninsured or unethical business practices. Due to the fast growing and technological advances in the HVAC industry, all of the Bertie Air employees attend weekly classes to help give us the upper hand in the field. Energy and Air Conditioning cost are of high concern to our customers; we are always looking for ways to improve our knowledge and staying on top of the technological advances in the field. Bertie Heating & Air Conditioning is an independent Trane Comfort Specialist™ dealer that meets Trane’s stringent qualification standards and is committed to being the best in every aspect of our business.